Large firms need a software they can trust. NextChapter provides a number of case management tools with the Whoa plan and even an innovative way to communicate & manage client communication firm-wide. 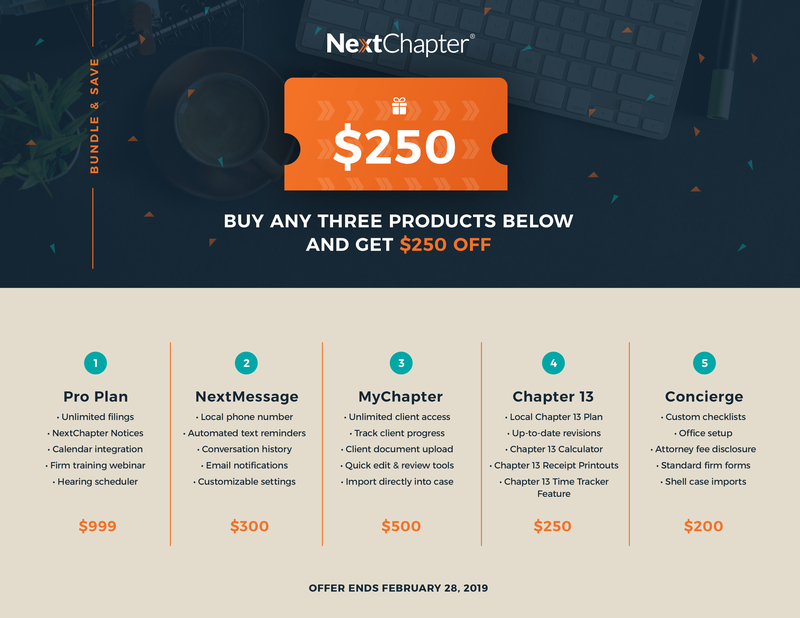 If you've just incorporated BK into your practice but aren't ready for an annual plan, you'll benefit from NextChapter's add-ons that'll get you up to speed. Allow NextChapter to be your business partner as your firm takes flight. With the new influx of cases, your firm will benefit from an annual plan (includes unlimited filings) and a Chapter 13 Plan. Streamline the client intake process with MyChapter Debtor Portal so you can focus more on managing & growing your practice. Solo attorneys can do it all with the right software. Use automation to your advantage with NextMessage and MyChapter Debtor Portal, which lessen time-consuming phone & email correspondence, as well as eliminate unnecessary meetings. Does you firm primarily take on Chapter 13 cases? Our district-customized Chapter 13 Plans ensure the most accurate & efficient filings. Give us a call at 888-861-7122 or email hello@nextchapterbk.com to get bundled up with NextChapter!